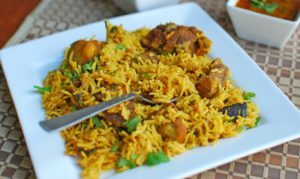 Boere Breyani -- A Twist on a Classic! The weather isn’t cold enough for a bowl of hot stew next to the fireplace, or hot enough for a good old fashioned braai. So, that leaves us with this deliciousness! What can be better than adding some juicy boerewors into some breyani rice- perfect! -Cut the boerewors into 3-5 cm-long pieces. Place the boerewors on the bottom of an ovenproof dish and top with the drained peach slices. -Season with salt and ground black pepper and add 2 cups raw rice and 1/2 cup brown lentils. -In a separate pan, brown the onions in a little olive oil and add the green pepper. Add curry powder (mild, strong or very hot), turmeric, Mrs Ball’s chutney and water. Mix well, remove from the heat and pour over the boerewors mixture. Ensure the rice and lentils are covered; if not, top up with water. -Cover and bake at 180°C for 45 minutes until the rice and lentils are cooked and all the liquid has been absorbed. If there’s still some liquid, put it back in the oven, uncovered, for a further 15 minutes. Serve with the usual curry condiments. Let us know what you think of this recipe on Twitter using the hashtag #ForTheLoveOfFood – we’d love to hear how you got on with this twist on a classic!